To make earrings using the drop with two wires technique, you have many options of the overall style and effect. You can create a long, shoulder-dusting look, or keep it simpler with a shorter design. 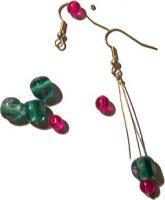 This method will show how to make earrings using a drop with two wires of different lengths. Having two drops the same length can look great as well, especially for smaller feature beads. 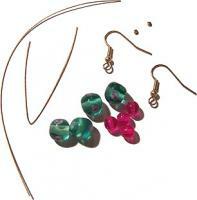 You can use clear or colored tiger-tail to make earrings as a drop with two wires. Clear tiger-tail gives the illusion that the beads are floating in place, while colored can make them look quite funky. Decide which look is for you, then get started! Cut the tiger-tail into two 6 inch pieces using the cutting edge of the pliers. Take one length of the tiger-tail, and fold it in half. Use the flat end of the pliers to press the fold, making the bend of the wire as flat as possible. Thread the earring hook on one side of the tiger-tail, until it rests in the fold. Thread the crimp through both ends of the tiger-tail, and slide it up until it traps the earring hook at the bend. Squash the crimp into place. 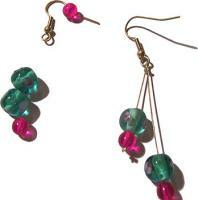 Put the first green feature bead onto either one of the tiger-tail ends, and follow it with a hot pink bead and a crimp. Squash the crimp at the end of the tiger-tail, as close to the edge as possible. Put the second green feature bead onto the other end of the tiger-tail, followed by the small hot pink bead and crimp. This time, allow the beads to sit just above the other group of beads. Squash in place, and cut the excess tiger-tail. Repeat on the other earring, ensuring that the second, smaller wire is the same size on each earring so that they are balanced. You now have a very funky pair of earrings that will complete any outfit. Now you know how to make earrings as a drop with two wires, why not try making another pair with even more wires? The trick is to cut each wire so that the beads sit just above the beads on the last wire. That way your design will always look well composed, balanced and will sit well - no matter how many people ask to get a closer look when you wear them! query: INSERT INTO accesslog (title, path, url, hostname, uid, timestamp) values('How to Make Drop Earrings with Two Wires', 'node/19', '', '3.84.182.112', 0, 1555950555) in /home/surelion/public_html/drupal-4.6/includes/database.mysql.inc on line 66.